The planning phase ends, the design phase is activated. The current status is highlighted by Ignas Degutis, acting Chief Executive Officer, Chief Financial Officer and Chairperson of the Management Board, and Kaspars Briškens, Business Development manager of the European gauge railway (1435 mm) infrastructure project Rail Baltica Central coordinator AS RB Rail, in a conversation with Dienas Bizness. “Rail Baltica (RB) project is being implemented at full speed, and we continue to do it without hindrance,” said I. Degutis, answering the question of whether there are any obstacles at the moment. The governments and parliaments of the Baltic States have ratified an Intergovernmental agreement, and the states have committed to finish the railway line by 2026. This commitment has recently been endorsed by the transport ministers of the three Baltic countries in a meeting with the European Commissioner Violeta Bulc. On October 26, she signed a decision by the European Commission to implement the trans-border RB project for the North-Baltic TEN-T Corridor, which means that the EU is committed to implementing this project. This document provides the next steps for the implementation of the project, its timing and total expenditure in the Baltic States and Poland. In addition, the European Commission and the coordinator of the North-Baltic TEN-T core network corridor Catherina Trautmann will be formally present as observers at the RB Rail Supervisory Board. The project is currently completing its planning phase, namely the business plan developed by Railistics and DB Engineering & Consulting GmbH, an operational plan developed by ETC Transport Consultants GmbH, as well as an infrastructure management model developed by Atkins. Until the next year, the Baltic governments have to decide on an optimal governance model, says I. Degutis. At the same time, the design stage is moving forward at a full speed. Six (66% of the length of the line) of 11 planned detailed technical design tenders have already been announced, two in each country, with a total of 44 applications. Recently the second round of detailed technical design for the procurement of the RB line through Riga was launched among six qualified candidates. The contract with the winner of the competition is planned to be signed in the first quarter of the next year. Applicants are supplier associations made up of large multinational and local companies, bringing together Western knowledge and regional expertise. Six tenderers are also in the procurement stage for the section from Misa to Vangaži in Latvia. For two sections – up to the borders of the two neighboring countries – detailed technical design tenders are still ahead. There will be three international stations for Rail Baltica in Latvia: for passengers in the Central Station and airport of Riga, and for cargo – an intermodal cargo terminal in Salaspils. In addition, next year a decision on the infrastructure service point, which is currently planned in Vangaži in Latvia, will be made. The design and construction of these point objects is the responsibility of the national implementer SIA Eiropas Dzelzceļa līnijas. Land acquisition for the project has already begun in Latvia. Speaking about the commercialization of the Riga Central Station section, K. Briškens points out that RB Rail encourages all the involved parties, including the government and the Riga City Council, to cooperate and be ambitious in order to have more added value for the station and its adjacent areas. A good example is the Austerlitz, one of the six major Paris railway stations, where re-development is planned to build a high-speed train connection and strengthen the multimodality of passenger transport. At the same time, development of surrounding areas is also on the agenda, including real estate projects and a new, on circular economy based smart urban region. Asked which country is the furthest ahead, I. Degutis emphasizes that the project will not work if either country completes something faster than the others. In Estonia, the joint venture has already announced the detailed technical design tenders for sections from Tallinn to Rapla and from Rapla to Parnu, while the third procurement – from Pärnu to the Latvian border – will be launched shortly. The acquisition of the land necessary for the project has already begun, and is planned to be completed along with the detailed technical designs in 2020-2021. 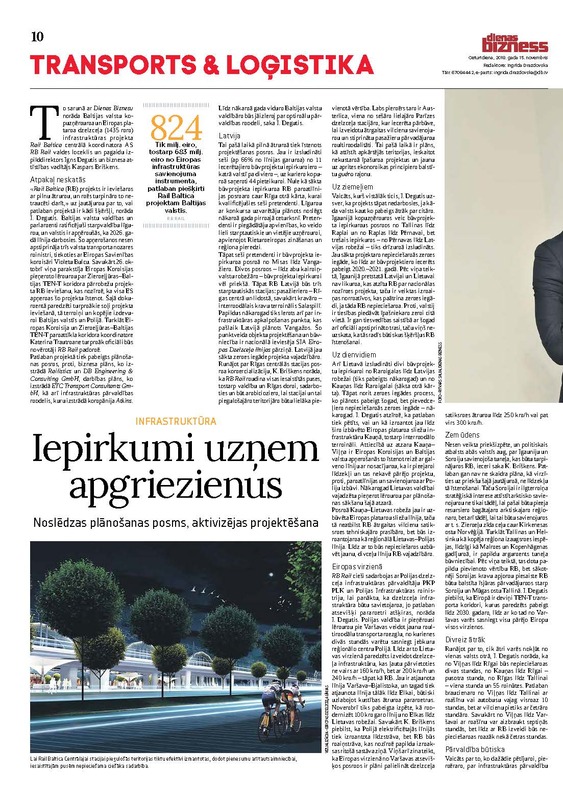 According to I.Degutis, in Estonia, as opposed to Latvia and Lithuania, there is no law recognizing RB as a national project, but changes have been made in the legislation that speed up the acquisition of the necessary land. Namely, the state has the right to offer the owner land in another place. There are also legal proceedings concerning this year’s officially approved route, but he believes that they will not create significant obstacles to the implementation of RB. Two detailed technical design tenders have also been announced in Lithuania for sections from Ramigala to the border of Latvia (to be completed next year) and from Kaunas to Ramigala (the second round was launched). There is also a land acquisition process that is planned to be completed this year, but the purchase of land for access roads -–next year. I. Degutis notes that it is currently being investigated whether and how to use the already built European railway gauge railway infrastructure in Kaunas, including the intermodal terminal. Regarding the Kaunas-Vilnius branch, it is the commitment of the European Commission and the Baltic States to implement it along the main line, provided that funds are available, and it does not hinder the rest of the project, that is, the main line and the construction of the connection with Poland. Next year, the Lithuanian government should decide on the start of planning for this branch. The section Kaunas-Lithuanian border already has a European gauge railway line. It does not meet the technical requirements of RB high-speed trains, but will be used as a regional Lithuanian-Polish line. Consequently, it will be necessary to construct a new, two-way line for the needs of RB. 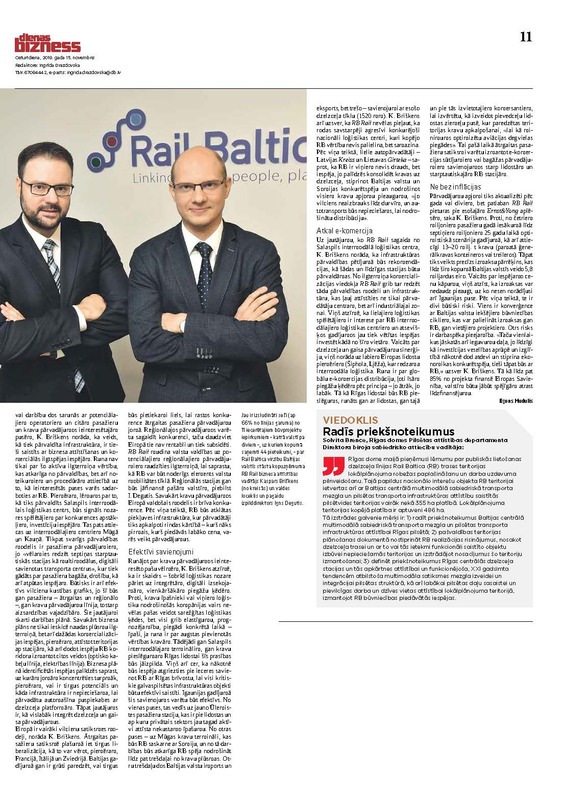 RB Rail works closely with the Polish Railway Infrastructure Manager PKP PLK and the Polish Ministry of Infrastructure to ensure that the railway infrastructure is compatible, as currently there are some parameters that differ, according to I. Degutis. The Polish government has decided to build a new multimodal transport hub in Warsaw, from which it would be possible to reach any regional center in Poland within two hours. Therefore, in the direction of Lithuania, it is planned to create a railway infrastructure that would allow it to travel no longer at 160 km/h, but at 200 km/h and 240 km/h, just like RB. The Warsaw-Bialystok line is already restored and currently the reconstruction is proceeding forward to reach Elka, significantly improving the speed parameters. In November, the study on the modernization of the 100 km long line from Elka to the Lithuanian border will be completed. In turn, K. Briškens adds that in Poland, the electrified lines use a direct current, while the RB will run on alternating current, which means additional costs in terms of the rolling stock. He also knows that in certain parts of Warsaw, Europe plans to increase the speed of rail traffic to 250 km/h or even above 300 km/h. A recent study has been executed, and there is growing political support in both countries, says K. Briškens about a tunnel connecting Estonia and Finland, which would be the continuation of RB. At the moment, however, there is no clear plan regarding how to move forward with this issue, nor the means to implement it. However, Finland has a long-term strategic interest in developing Arctic connections not only for its own access to the rich arctic region, but also for connection to the so-called Northern Silk Road through the Kirkenes port in Norway. In addition, the growth potential of Tallinn and Helsinki as a common region, as in the case of Malmö and Copenhagen, is an additional argument for the construction of the tunnel. According to K.Briškens, this would provide additional value to RB, however, it has to be noted that initially the attraction of Finland’s freight volumes to RB would be based on short sea shipping between Finland and Mugas Port in Tallinn. I. Degutis adds that there are nine TEN-T transport corridors in Europe, which are expected to be completed by 2030, therefore Warsaw will be able to reach the rest of Europe in all directions. Speaking about how fast it will be possible to get from one country to another, I. Degutis points out that from Vilnius to Riga it will take two hours, from Kaunas to Riga – an hour and a half, from Riga to Tallinn – one hour and 55 minutes. Currently, the journey from Vilnius to Tallinn with a car or bus takes at least 10 hours, but the train will be able to cover the same distance in four hours. Moreover, going from Vilnius to Warsaw by car takes seven hours, but with the creation of RB it will take less than four hours. Asked about what various studies, such as the Infrastructure Management Study or the Operational plan, will contribute in talks with potential operators and other stakeholders in passenger and freight transport, Mr. Briskens points out that the way in which infrastructure is managed is directly related to the business development and commercialization sustainability opportunities. It is not just about the long-term value of these assets, which depends on the governance, but also about the rules and procedures that define how stakeholders can work with RB. For example, the decision on how the Salaspils Intermodal logistics center will be managed will signal the players in the sector about the conditions of competition and investment opportunities. The same applies to intermodal centers in Muga and Kaunas. An equally important governance model is for passenger transportation, because “we want to see seven international stations as multimodal, digitally interconnected transport centers”, which provides passenger luggage, safety and recreational facilities. An effective train timetable is also important, as it will operate for both passenger trains – high-speed and regional ones, and freight lines, including defence purposes. These issues are dealt with in the operational plan. The other study, the business plan, not only outlines the long-term cash flow but also various commercialization opportunities, for example, by developing areas around the stations, as well as giving the possibility to use the RB corridor in other ways (optical cable line, electricity line). The opportunities identified in the business plan will help to understand on which areas to focus on in the future, for example, whether there is a market potential and what infrastructure is needed to carry car semi-trailers with rail platforms. Another question is what would be the best way to integrate rail and air transport. There are several train models in Europe, says K. Briškens. Liberalization of the market in high-speed passenger traffic is taking place, for example, in France, Italy and Sweden. In the case of Baltic States, it is difficult to predict whether the market will be large enough to have significant competition in the high-speed passenger transport. Competition could be expected in regional transport, but in many places in Europe, they are not profitable and are subsidized. 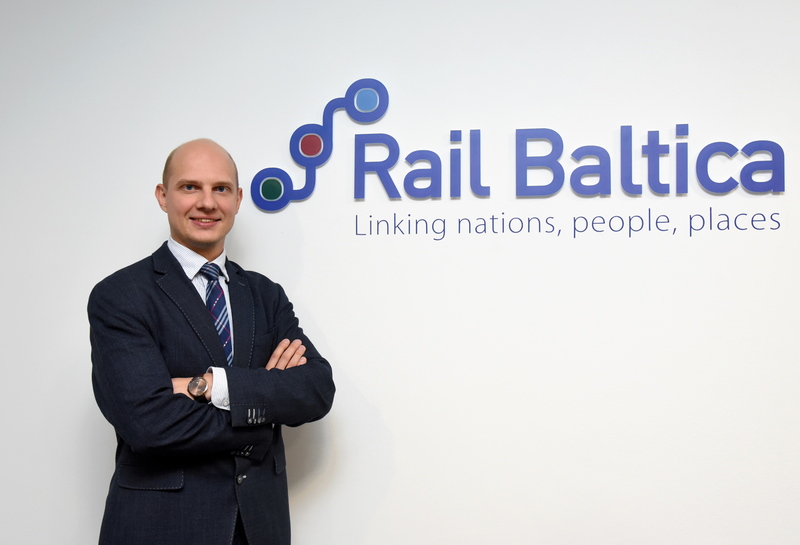 RB Rail encourages national governments to look at the potential of regional transport in the long run in order to understand how RB can be a useful element in the national mobility network. I. Degutis also adds that the regional stations will have to be financed by the countries themselves. It is useful to remember that the existing model for freight transport in Europe is based on free competition. According to K. Briškens, RB will have an open access infrastructure, where carriers will be served on a first-come, first-served basis – who will come first and will offer the best price, will be able to provide transportation. Speaking about the wishes of freight customers, K. Briškens notes – it is clear that the logistics industry is now moving into integrated, digitally traceable, simpler supply chains. Namely, cargo owners or their logistics companies no longer want to create complicated logistics chains themselves, but all of them want flexibility, predictability, delivery at a specific time, especially when it comes to high value-added freight. Thus, both the Salaspils intermodal terminal and the cargo connection to Riga airport will have to fulfill these requirements. He also hopes that in the future, it will be possible to return to the idea of connecting RB to the Freeport of Riga, so that all critical infrastructure of the capital is effectively connected. In the case of Estonia, this connection is expected to be effective. On one hand, it will lead to the new Ulemiste Passenger Station, which is near the airport and the surroundings are already being actively developed by the private sector in terms of real estate. On the other hand, the Mugas cargo terminal, which will be RB interface with Finland, and its operations will determine the RB ability to provide up to one-third of the total freight flow. The other third will be imports and exports from the Baltic States, and the last – connections to the existing rail network (1520 mm). K. Briškens also emphasizes that RB Rail does not want to allow the emergence of mutually aggressively competitive national logistics centers, which would not only stall, but even reduce the overall value of RB. To the question about what RB Rail expects from the Salaspils intermodal logistics center, K. Briškens answers that the Infrastructure Management study will contain recommendations on how such and similar stations should be managed. From the long-term commercialization perspective, RB Rail wants to see a management model and infrastructure that allows for the development of not only the carrier center but also of the industrial zone. He notes that large logistics players are interested in RB intermodal logistics centers, and in some cases the opportunities to invest in one of these sites are already being explored. Asked about the synergy between rail and air transport, he points out good examples of European airports (Schiphol, Liege), where intermodal logistics can be observed. In global e-commerce distribution, very short supply chains according to the principle – the faster, the better, are necessary. As the airport of Riga will have a RB connection, it is discussed both with the airport and its merchants located there to evaluate how to set up the access road on the northern side, where the territories for cargo service are intended, “to at least optimize the supply of aviation fuel.” At the same time, high-speed passenger traffic could be used for e-commerce delivery or luggage transport between airports and international RB stations. Transportation volumes will be updated after one or two years, but for now RB Rail relies on the estimates of Ernst & Young, says K. Briškens. In particular, from four million passengers per year initially up to seven million over a period of 25 years in the case of an optimistic scenario, as well as between 13-20 million t cargo (mainly in general cargo containers or trailers). The exact cost re-calculation will be made, which so far in the Baltic States totals 5.8 billion euros. Asked about the possible rise in prices, he acknowledges that the cost may slightly increase, which has been recently pointed out by Estonian side. According to him, there are two significant risks. One is the convergence with the internal construction cycles of the Baltic States, which can increase the cost of both RB as well as local projects. The second is the availability of workforce. “However, at the same time, we need to look at the benefits, because, just like investing in health care and education in the future, it will give a return and strengthen the competitiveness of the economy, it will be the same with RB,” stresses K. Briškens. Since up to 85% of the project is funded by the European Union, countries should be able to find co-financing. 824 million euros, including 683 million euros from the Connecting Europe Facility, are currently allocated to the Rail Baltica project in the Baltic States.